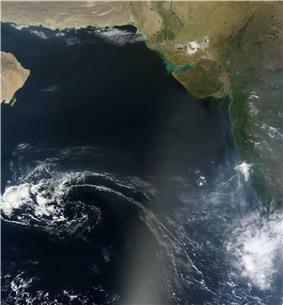 The Arabian Sea is a region of the northern Indian Ocean bounded on the north by Pakistan and Iran, on the west by northeastern Somalia and the Arabian Peninsula, and on the east by India. An ancient name was the Erythraean Sea and Persian Sea. 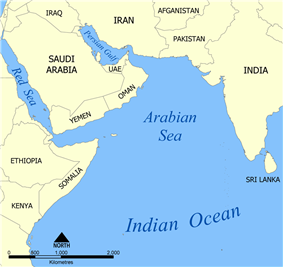 The countries with coastlines on the Arabian Sea are Somalia, Djibouti, Yemen, Oman, Iran, Pakistan, India and the Maldives. There are several large cities on the sea's coast including Karachi, Gwadar, Pasni, Ormara, Aden, Muscat, Mumbai, Keti Bandar, Salalah, Duqm and Kochi. Masirah (Arabic: مصيرة‎) is an island off the East coast of Oman. The main industries here are fishing and traditional textile manufacturing. Formerly, traditional ship building was important. The rugged terrain of the island and surrounding rough coastline has led to the appearance of many wrecked dhows on the beaches of the island, most of them well preserved by the salt water and intense heat. The ocean bottom environment surrounding Masirah is hostile as the majority of the area is covered in either sand or hard rock. Despite the poor quality ocean bottom, the area is very productive with marine fisheries, and any hard objects (barrels, engines) are immediately colonized by local fauna. 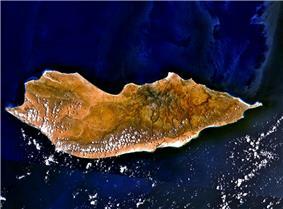 Socotra (Arabic: سُقُطْرَى‎ Suquṭra), also spelled Soqotra, is the largest island, being part of a small archipelago of four islands. It lies some 240 kilometres (150 mi) east of the Horn of Africa and 380 kilometres (240 mi) south of the Arabian Peninsula. The island is very isolated and through the process of speciation, a third of its plant life is found nowhere else on the planet. It has been described as the most alien-looking place on Earth. Astola Island, also known as Jezira Haft Talar (Urdu: جزیرہ ہفت تلار‎) or 'Island of the Seven Hills', is a small, uninhabited island in the northern tip of the Arabian Sea in Pakistan's territorial waters. It is a popular eco-tourism destination in the region. Overnight tourists camp on the island and bring their own provisions. Camping, fishing and scuba-diving expeditions are popular. It is also a site for observing turtle breeding. Endangered animals such as the green turtle (Chelonia mydas) and the Hawksbill turtle (Eretmochelys imbracata) nest on the beach at the foot of the cliffs. The island is also a very important area for endemic reptiles such as the Astola Viper (Echis carinatus astolae). There are several islands in the Arabian Sea, with the largest being Socotra (Yemen), Masirah (Oman), Astola Island (Pakistan) and Andrott (India). Major Indian ports in the Arabian Sea are Kandla Port, Nava Sheva, Kochi, Mumbai Port, Kollam Port and Mormugão. The gate facing the sea was called "Kharadar" (salt gate), and the gate facing the Lyari River was called "Mithadar" (sweet gate). The modern neighbourhoods around the location of the gates are called Mithadar and Kharadar. Surrounded by mangrove swamps to the east, the sea to the southwest, and the Lyari River to the north, the town was well defended and engaged in a profitable trade with Muscat and Bahrain. Karachi is also mentioned in the sixteenth century Turkish treatise Mirat ul Memalik (Mirror of Countries, 1557) by the Ottoman captain Seydi Ali Reis, which is a compilation of sailing directions from the Portuguese island of Diu to Hormuz in the Persian Gulf. It warns sailors about whirlpools and advises them to seek safety in "Kaurashi" harbour if they found themselves drifting dangerously. The Port of Karachi (Urdu: بندر گاہ كراچى, Bandargāh-i Karācī) is Pakistan's largest and busiest seaport, handling about 60% of the nation's cargo (25 million tons per annum). It is located between the Karachi towns of Kiamari and Saddar, close to the main business district and several industrial areas. The geographic position of the port places it in close proximity to major shipping routes such as the Strait of Hormuz. 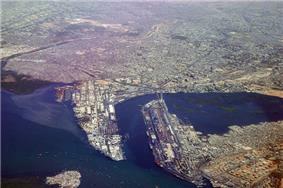 The history of the port is intertwined with that of the city of Karachi. Several ancient ports have been attributed in the area including "Krokola", "Morontobara" (Woman's Harbour) (mentioned by Nearchus), Barbarikon (the Periplus of the Erythraean Sea, and Debal (a city invaded and captured by the Muslim general Muhammad bin Qasim in 712 AD). There is a reference to the early existence of the port of Karachi in the "Umdah", by the Arab navigator Sulaiman al Mahri (AD 1511), who mentions "Ras al Karazi" and "Ras Karashi" while describing a route along the coast from Pasni to Ras Karashi. 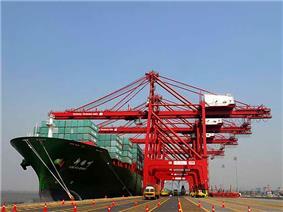 Jawaharlal Nehru Port in Mumbai is the largest port in Arabian sea, and the largest container port in India. The Arabian Sea historically and geographically has been referred to by many different names by Arab travelers and European geographers, that include Persian Sea, Sindhu Sagar, Erythraean Sea, Sindh Sea, and Akhzar Sea. On the West. 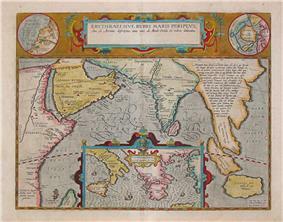 The Eastern limit of the Gulf of Aden [The meridian of Cape Guardafui (Ras Asir, 51°16'E)]. On the North. 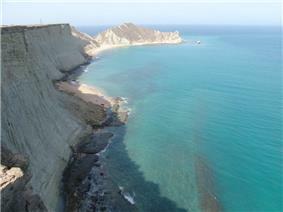 A line joining Ràs al Hadd, East point of Arabia (22°32'N) and Ràs Jiyùni (61°43'E) on the coast of Pakistan. On the South. A line running from the South extremity of Addu Atoll (Maldives), to the Eastern extreme of Ràs Hafun (Africa, 10°26'N). On the East. The Western limit of the Laccadive Sea [A line running from Sadashivgad Lt. on West Coast of India () to Corah Divh () and thence down the West side of the Laccadive and Maldive Archipelagos to the most Southerly point of Addu Atoll in the Maldives].